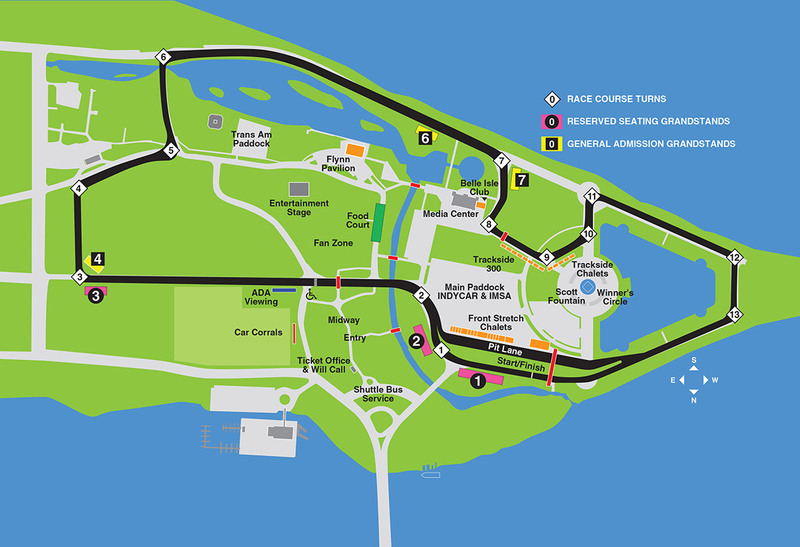 The Chevrolet Detroit Grand Prix presented by Lear offers round-trip shuttle service that runs continuously from two downtown Detroit locations as well as Windsor, Ontario, Canada. Shuttle service from downtown Detroit is provided at no charge. Surface lots, parking decks and street parking throughout downtown Detroit. GM Renaissance Center surface lot (east of the GM Renaissance Center on Atwater between St Antoine and Rivard). The GM Lot is automated and only accepts credit cards. This parking deck is fully automated. For a faster and smoother exit, validate your ticket at the kiosks on Level One or Level Two inside of Beaubien Garage before retrieving your vehicle. The Level One Kiosk is located next to the elevators. The Level Two Kiosk is located directly at the base of the wheelchair ramp. Shuttle passengers will be dropped off and picked up at a staging area on Belle Isle known as the Shuttle Transportation Center. Shuttle buses run continuously during hours listed below. Windsor International Transit Terminal – Proper documentation required to cross the international border. Continuously until 30 minutes following the Saturday night concert and last race on Sunday or until all guests are accommodated. Returning passengers to downtown Windsor must board the “Windsor Shuttle” only. Boarding area is the same as shuttle drop-off location, at the corner of Sunset and Mroch Dr – wristband required to board. A group of purpose-built wheelchair accessible vans/buses have been contracted to be of service to mobility challenged individuals who are unable to board the shuttle buses or must be transported in wheelchairs. Each vehicle holds two wheelchairs at one time. Shuttles will be deployed on demand to either inbound shuttle stop location in downtown Detroit. All suggested downtown Detroit parking lots are wheelchair accessible. Note: Transportation information, as well as all other event-related information, can be found in the 2019 Event Guide.